OMEGA’s PX2088S Series smart pressure transmitters maintain a specification conformance of at least 3σ The reliable performance of these rugged transmitters, when coupled with the broad selection of options, makes these transducers an exceptional value for tough process applications. 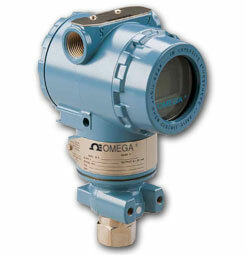 The PX2088S is designed to operate safely in the event of damage or failure to the sensor diaphragm. The electronics compartment is isolated from the process by 2 seals. A third seal isolates the field terminals and conduit entries. This design ensures against housing pressurization and process contamination. The electronics incorporates an ASIC module that accepts the digital signal from the sensor, along with the correction coefficients, then corrects and linearizes the signal. This is then converted to an analog signal for retransmission. The output section also handles the HART® communications. Zero Elevation and Suppression: Zero can be suppressed between atmosphere (or 0 psia for absolute ranges) and the upper range limit (URL), provided the span is ≥ the minimum span and the URL does not exceed the units URL. No vacuum calibrations are allowed on the gage pressure models. Nota: See Specifications for Fitting Material and Fill Fluid options.Absolute Pressure ranges and options availible, consult Part Number Builder below for model numbers.